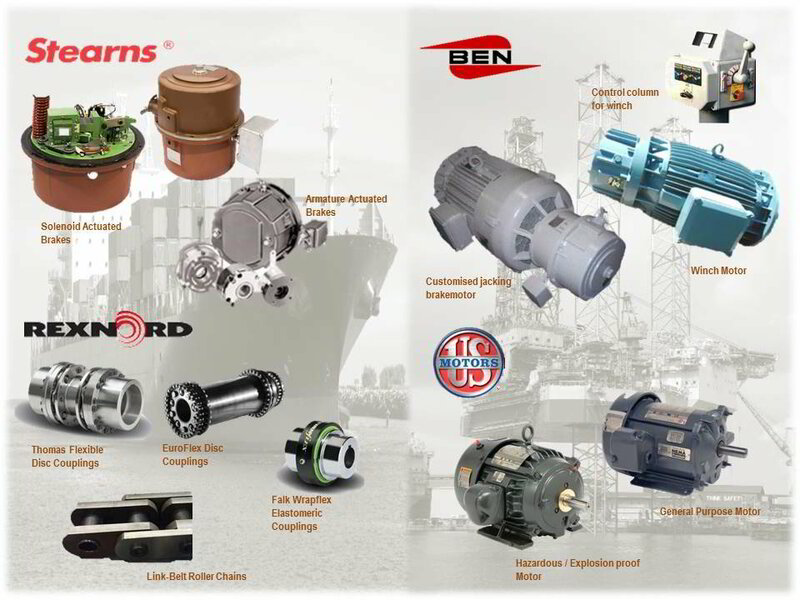 DURING THE LAST 15 YEARS, WE WORKED ON MORE THAN 100 PLATFORMS, SUPPLYING TO SOME OF THE WORLD'S LARGEST RIG BUILDERS CUSTOMIZED BRAKE MOTORS FOR JACKING SYSTEM IN ACCORDANCE WITH PROPRIETARY SPECIFICATIONS, IN COMPLIANCE WITH ABS, DNV & LLOYD CERTIFICATIONS. Our company have produced more than 4,000 brake-motors of proprietary designs for offshore jacking application. We have the expertise to engineer and produce customized Brake, AC & DC Motor and Gearbox to meet individual customer requirements. US Mechatronic (S.E.A) Pte Ltd has been the exclusive representatives for US Motors. We introduced BEN Buchele Elektromotoremwerke Gmbh into the Singapore market. 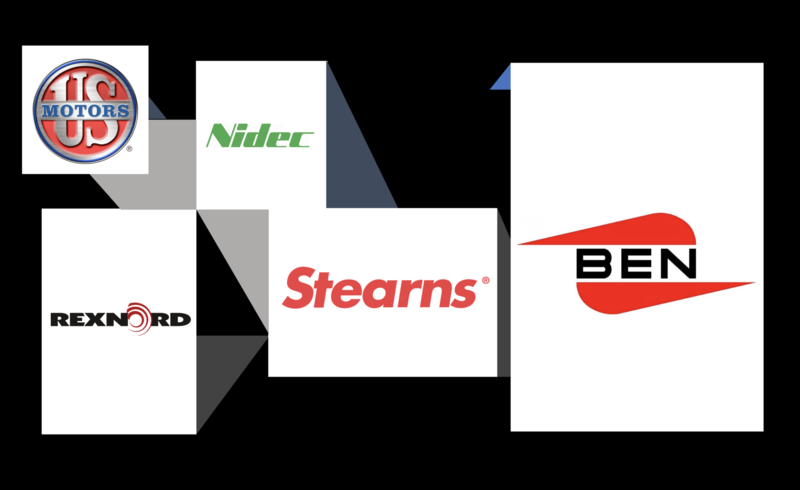 Today, the brands we represent include Stearns Brakes, Rexnord Thomas Couplings and Gear Drives. Our stock in Singapore includes AC Motors ranging from standard TEFC motors to Explosion Proof Motors, UL Labelled (UL) from 1 HP to 150 HP, 2 Poles, 4 Poles and 6 Poles, Low Voltages. Our Motors are in compliance to EPACT .92 Efficiency Standard, Canadian Standards Associations (CSA) and Underwriters Inc. (UL), IEC Standard, IP56 & IP67 enclosure protection, ABS & DNV certified. Continue our 22 years track record of providing customers with innovative, effective and efficient solutions to their motor and drive problems. Our company upholds the highest quality and reliability of our products and services to exceed customers’ satisfaction and requirements. We have our own in-house service teams to provide a prompt service for troubleshooting and repair work. Our products are used in Offshore and Marine, Oil and Gas, Pulp & Paper, Recycle Plant, Semi-Conductors Plant Clean Room, Water Treatment Plant, Food Industry and other general industries. We cover countries in South East Asia. We fully understand the challenges our customers face. Therefore, our principals and our local team provide innovative and efficient solutions to deliver products to meet performance criteria. We are committed to keep our promises to customers. We cultivate in our environment the philosophy of continuous improvement to all aspects of what we do, and to attain the highest standard of performance. Together with our close collaboration with factories in USA and Germany, our team in Singapore serves customers with superior performance and efficiency. We pride ourselves for successfully earning the trust and confidence of our customers over 22 years. WE ENGINEER AND MANUFACTURE TO CUSTOMER'S PROPRIETARY REQUIREMENTS.
" 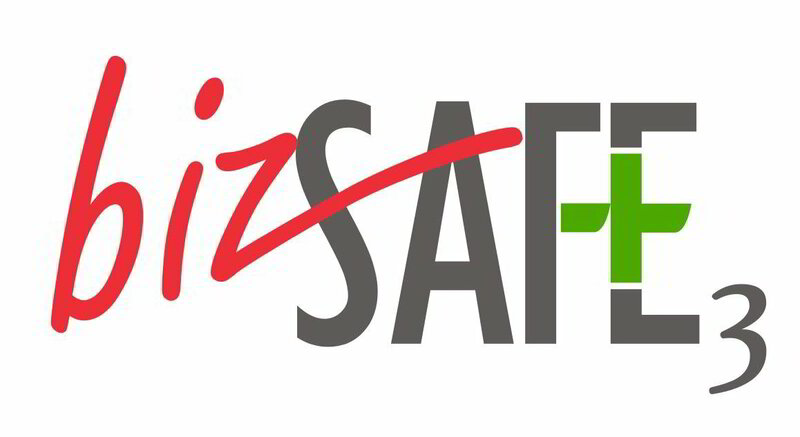 Our products are manufactured to the highest quality by strict operation and production systems compliant to certification and standards in order to meet the requirements of every country in the world. " Our in-house service team will answer within 2 working days.